None. Marigold cannot tolerate cold temperatures. Tomato, Cabbage, Squash, Pumpkin, Cucumber, Melon, Cauliflower, Kale, Potatoes, Black Currant, Red Currant, White Currant, Beans, Orange, Lime and Lemon. Dwarf types make good edging plants that may deter rabbits. Some varieties are known for their ability to starve out rootknot nematodes when planted as a mass. Sow marigolds in late spring, or set them out as bedding plants. In climates with long, hot summers, make a second planting in summer for great autumn color. Broadcast seed into cultivated soil so that the seeds are about 2 inches (5 cm) apart and one-half inch (1 cm) deep. Thin to 8 inches (20 cm) apart in all directions for dwarf varieties; allow 12 inches (30 cm) between very tall varieties. 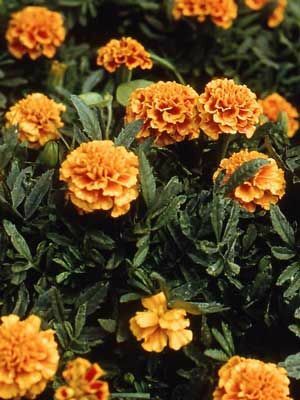 The 'Gem' marigolds (T. tenufolia) bear edible blossoms with a spicy, citrus flavor. Marigolds make good short-stemmed cut flowers for small bouquets. Don't rush to pull up plants that stop blooming but look healthy, because they will probably come back into bloom. Marigolds have few problems with pests or diseases. Tall varieties may need staking to keep them upright.